In spite of falling out of vogue in recent times, it certainly isn’t dead. The white paper continues to serve a number of important sales and marketing functions, such as generating new leads, increasing your company’s profile as a thought leader, and setting your brand apart from your competitors. So, before you too proclaim the death of the white paper, consider the following four reasons why white papers are a critical part of any successful brand’s sales and marketing toolkit. Create quality white papers for your business by outsourcing to freelancers. To learn how to find and hire the best writers, download The Content Strategist’s Playbook, Compose.ly’s free content marketing ebook. Let’s start off by addressing the elephant in the room – the ebook. Much has been written about how the ebook has superseded the white paper in both functionality and versatility. In a nutshell, it’s argued that ebooks have contributed to the white paper’s demise because they offer a more contemporary approach to marketing, as well as a more engaging and shareable read. And we must say… we’d have to agree! Ebooks are a newer approach to marketing. Ebooks are written in a more approachable way for the average reader to engage with. Ebooks are easier to share on social media and go viral. But that’s because ebooks target a different goal, tone, and audience than white papers. As you can see, there are marked differences and similarities. It’s therefore pointless to declare one more worthy than the other. Instead, a more constructive approach is to weigh up which better matches the particular objectives and audience of the particular service or product you want to promote. For example, if you’re looking to create a piece of content on a general or specific topic which carries a more engaging and approachable tone, then an ebook will better suit your needs. Whereas, if you’re wanting to convey a more serious and authoritative tone when writing about a specific issue, a white paper is the way to go. 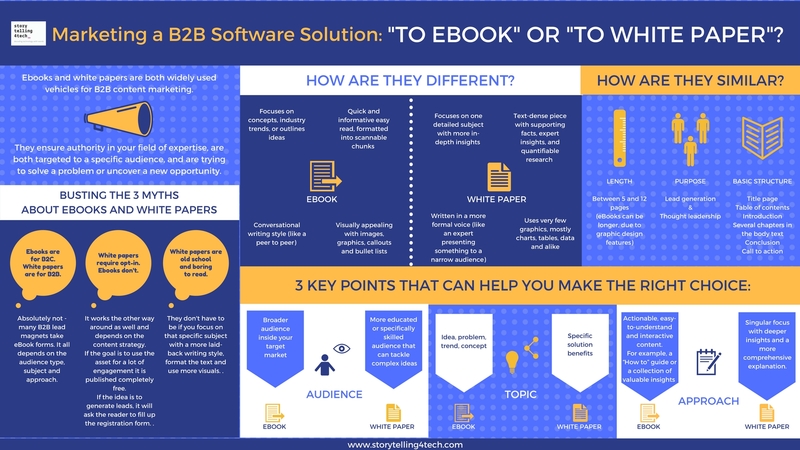 The “which is better – ebooks or white papers?” battle needs to stop – as this infographic shows, they both have their own merits [Click image to expand] (Image credit: Storytelling4Tech). The bottom line is that you should select the content tool which best meets both your company’s and audience’s needs – sometimes that will be a white paper, sometimes that will be an ebook, and other times that will be another content type entirely. Even though the characteristics of white papers and books follow general rules and trends, there is no need to stay within such constraints. Take, for example, our ebook, The Content Strategist’s Playbook. We made it B2B focused, going against the “typical” B2C trend of ebooks. One of the key attributes of white papers is that they are an effective means of generating leads. Successive studies have shown that white papers are a tried and tested means of collecting information from customers and buyers. Take the above graph from Business.com’s survey of 500+ of its lead generation advertisers. It highlights that most of the surveyed companies hold white papers in high regard as a lead generator, with more than half of the companies indicating that white papers are a “valuable” or “extremely valuable” source of leads. In fact, white papers proved to be the top choice of lead generation strategies included in the survey. One of the reasons white papers generate such a high number of leads is that people are willing to hand over their information to read them. DemandGen’s 2017 Content Preferences Survey Report showed that 76% of buyers were willing to register for and share personal information in exchange for white papers – 13% more than those who would do so in exchange for an ebook. What information can I obtain from my leads? The easiest way to capture leads is to use a lead capture form on the landing page of your white paper. All you have to do is set your lead capture form to require certain mandatory information from the user (a.k.a. your lead) before they can download your white paper. To refer to a real-life example, Zeta’s lead capture form above requires you to provide your full name, company name, business email, and phone number before you can access their white paper, Future of Relevance – Identity Management. If you’d like to gather even more information upfront, you can make it mandatory to provide information such as their job title, business size, and any other specific information you want to obtain. For example, in order to download Pearson’s white paper, On Track: Redefining Readiness in Education and the Workplace, you must not only provide your basic details, but also your job title, school/district name, instructional needs, and learning landscape. While it can certainly be useful to ascertain more information from your leads, requiring too much mandatory information up front may result in dummy answers, or even dissuade people from signing up. For that reason, it’s a good rule of thumb to only make the most important information about your lead mandatory, and keep the rest optional. So, how can I promote my white paper for lead generation? Social media: Share it on your social media channels, as well as put social buttons on your landing page and within the white paper itself. Company blog: Create a write-up of your white paper on your blog, or create a series of blogs on it. Paid marketing: Promote your white paper via a PPC campaign (Google AdWords), targeting search queries relevant to its topic. SlideShare & Webinars: Repurpose it as a SlideShare presentation or webinar to get more mileage from your white paper. Newsletter: If you have one, feature your white paper in your newsletter. You could even do a Q&A with its author/s. “Thought leadership” has become a buzzword in recent times, so you may be wondering if it’s even worth looking into and investing in. It is – and white papers are a key means of contributing to your company’s thought leadership efforts. But before we begin to discuss how white papers can help, let’s first look into what thought leadership is, and why it’s important. Thought leadership is important as it forms the foundations of trust between brand and consumer. CEO & Founder at Blue Fountain Media, Gabriel Shaoolian, believes that thought leadership achieves this by showing expertise and authority within an industry, which consumers take as an indication of the brand being among the best at what they do. Think about it: aren’t you far more likely to purchase a product or service from a brand you believe is among the best of the best? Your consumers are the same. It increases your brand’s strategic visibility with customers, clients, partnerships, funders, etc. It leads to exposure for your brand’s ideas and access to notable people within your own industry, the media, researchers in government or regulatory circles, etc. It makes your brand become more persuasive, and gives you the status and authority to change the direction of a certain issue or topic. It can help your brand bring about meaningful change as your influence and platform grows. So, how can publishing white papers help with thought leadership? Sounds familiar right? That’s because it matches up with the aim of thought leadership (“…to consistently answer the biggest questions on the minds of your target audience, on a particular topic.”). The most straightforward approach to creating a white paper for thought leadership is to address a problem that has long plagued your industry, and subsequently, provide an effective solution to it. While it may seem obvious to state, the problem your white paper presents should be one your company can solve with its products or services. “The idea about this is that once readers have learned about the solution to an irksome problem that has been afflicting virtually everyone in their industry, they get to see the white paper sponsor or author as the “hero” who takes the nagging problem away,” Ijidola says. For example, Ericsson, a brand that describes themselves as “at the forefront of communications technology” and “a global leader in delivering ICT solutions” has published a number of white papers. As shown in the sample above, all of Ericsson’s white paper topics are directly relevant to the products they provide. Rather than employing hard sell tactics to draw attention to their products or brand, the information and research detailed in the white paper implicitly promotes the usefulness and progressiveness of Ericsson’s products. The implication is that the reader begins to associate Ericsson as a brand with extensive understanding and know-how about these topics, thus adding to their sense of authority within their industry. And next time their readers want to purchase a telecommunications product, which brand you think will pop in their heads? Ericsson: The company that positioned itself as a thought leader. In summary, if you want to become the company that potential customers associate with thought leadership, a white paper is one tried and tested means of getting you there. If you want to put your company on the map, you need to find a way to set it apart from the competition. While it can be safely assumed that your competitors create content for social media and engage in some sort of blogging, it’s significantly less likely that they are creating white papers. Statistics from a survey AlterraGroup conducted show that white papers and ebooks ranked only fifth in B2B marketer’s most used content marketing vehicles. While most create social media content (83%) and blogs (80%), white papers and ebooks (65%) are only created by around two-thirds of B2B marketers. If you’re looking to offer buyers something different than everyone else, a white paper may be your answer. Of course, you shouldn’t just publish one for the sake of it. As we mentioned earlier in our discussion of white papers vs ebooks, you should always pick the content medium that suits your particular business needs and audience. Moreover, in order to have a positive impact on your content strategy, your white paper needs to offer genuine insights and food for thought about a topic which is of interest to your audience. It needs to offer original points of view and research, and get into the nitty-gritty of a problem and its possible solutions. That all being said, if you are looking for a platform to both demonstrate your deep understanding of a certain topic and make you stand out from the crowd, a well-researched and compelling white paper is one of your best bets. Want to publish an impactful white paper but don’t have the time or know-how? Hire an expert white paper writer to help you out. White papers, as we have explored, are very much alive and kicking. They have demonstrated their continued relevance and usefulness in an ever-changing marketing landscape – even with the advent of ebooks. White papers are a fantastic lead generator, thought leadership kick-starter, and an effective way to set you apart from your competition. So the next time you find yourself in a debate about what type of content you should create next, perhaps you’ll spare a thought for the humble, but formidable white paper. What do you think of the whole “the white paper is dead” statement? Do you have any tips for creating a great white paper? Share your thoughts and ideas below!